As the consumer journey becomes a more complex network of interactions between brands and users, marketers need to work harder to keep leads moving towards the sale. Your trusty marketing funnels are generally going to be the same as they were a few years ago but the number of touchpoints along the way has likely increased. At the same time, user expectations are evolving and your competitors are constantly offering a more tempting package to your target audience. When this happens, leaks are inevitable and it’s not unusual to see the performance of sales funnels decline over time – even if they were performing excellently in the past. In more serious cases, your funnels may have never been performing to the level you needed. Either way, you need to plug those leaks. Before you can fix a leaky marketing funnel, you need to know where you’re losing leads. Pinpointing your leaks requires a certain amount of user data and tracking their movements along your funnel across various user sessions. You need to pinpoint the final actions users are commonly taking before dropping out of your funnels. For example, you may see a large portion of users take no further action after signing up for your newsletter – a common problem. Or you may find too many users are quitting the session before paying for the items in their shopping basket. You’ll probably also have less obvious leaks, though, such as a high number of users dropping off after visiting a specific page. With ActiveCampaign’s site and event tracking, we can pinpoint where users drop off from our sales funnels, based on their last action. And this tells us where we need to look in order to find out why they’re dropping off. Knowing where you’re losing leads is one thing but you’re not going to understand how to plug them unless you know why you’re losing leads in the first place – a different challenge entirely. UX problems: For example, slow loading times, poor mobile optimisation or compatibility issues. Conversion killers: Aside from UX problems, also pay attention to web forms, interruptions (such as popups or notifications) and page visits that suddenly kill your chances of converting. Weak CTAs: If your calls to action aren’t compelling enough, leads are always going to leak. Inactivity after conversions: You’re not following up conversions quickly or effectively enough – email confirmations, reminders, promotional offers, loyalty programmes, etc. Low email engagement: It’s difficult to nurture leads if your main source of contacting them directly isn’t getting the engagement you need. Low customer retention rate: Your work isn’t done once you convert a lead; your next mission is to turn this customer into a repeat buyer. In terms of pinpoint why your leads are dropping out at certain stages of the consumer journey, you’re going to need to delve a little deeper into your data. If email engagement is a problem, find out which campaigns have performed well and compare them to the ones that are underperforming – what are you doing differently? For conversion killers such as poor web form design, you’ll need the tools to access this kind of user data. Leadformly gives you web forms optimised for performance from the get-go but you also get its built-in form analytics features to help you see why users aren’t completing your forms. In terms of weak CTAs and other on-page issues, this is where a good CRO tool like Hotjar pays for itself. 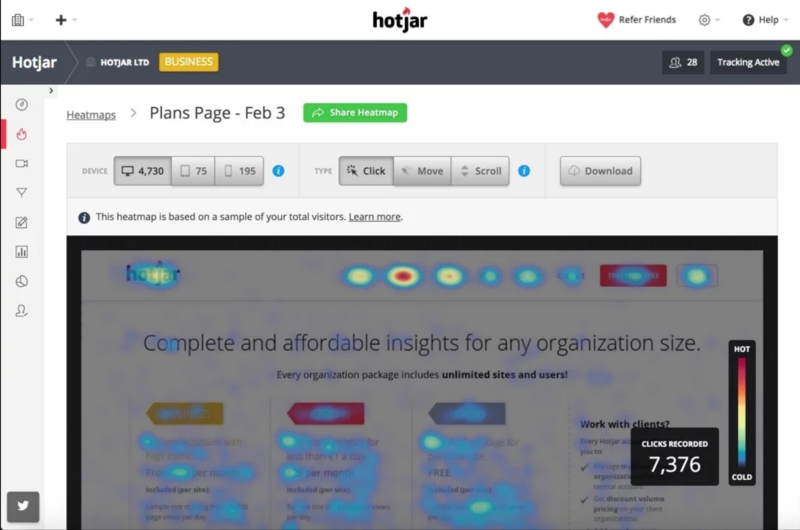 With its heatmapping and user session recordings, you can determine which CTAs aren’t making the right impact. You can read our Hotjar review to find out what we love about the platform, as well as what we’re not so keen about. One of the other Hotjar features on our love list is its survey and feedback options, which make it easy to reach out to users and ask them why they haven’t taken a certain action. Don’t be afraid to ask people directly. Once you know where and why users are dropping off, it’s time to plug the leaks in your marketing funnel. Hopefully, you have a good idea of what needs fixing at this stage (eg: you need a “better” call to action) but now you have to actually implement your changes – and this is going to require a little testing. A/B testing to be more precise. First, you need to know exactly what you’re trying to achieve and which metrics and KPIs best represent this. Sure, you want a better call to action but what does this actually mean – higher conversion rates, a better quality or targeting a more specific type of user? Sometimes the best way to stop leads slipping away is to reduce conversions at the top of your sales funnel and focus on converting users who are most likely to buy from you. It’s generally better to have 1,000 quality leads than twice as many low-quality prospects – especially if you expend a lot of time and resources on trying to close each deal. The key to getting the most out of every conversion is an effective lead nurturing strategy and this is something you should periodically refine to improve performance. If leads are slipping away between actions, you need to be doing something about it. One of the biggest mistakes brands make is failing to respond to leads quickly enough. We recently published an article explaining some research from Harvard Business Review that shows brands need to be responding to leads within 24 hours. Leads turn cold much faster than most marketers want to believe and this is one of the biggest causes of leakage, particularly at the top of the funnel. The same concept applies to later stages of the consumer journey as well, though. If your leads are slipping between different actions (eg: signing up for a free trial and upgrading to the paid version of your software platform), then you need to reach out and push them closer to taking the next step. It could be something as simple as an email reminding people they haven’t signed in recently and showing them what they’re missing out on – eg: you could have made 300 extra sales this week, businesses like yours have saved an average of £34,000 this month, you’re wasting up to 6 hours every week, etc. To manage these crucial interactions between different conversion goals, you’re going to need a solid CRM platform and this is where ActiveCampaign comes back into action for us. First, we use Leadformly to qualify leads on our website by using forms built with conditional logic. This allows us to get more detailed information from users and determine what kind of followup message to send them. Next, each lead is automatically assigned to a segmented list in ActiveCampaign, based on the info they type into our web forms and they’re sent a follow-up email that addresses their specific needs. From here, we can create a more complex network of automated email responses to make sure every lead is engaged throughout the entire consumer journey. One of the biggest mistakes brands make with their marketing efforts is to pull their foot off the gas once they’ve got the sale. This is crazy considering the amount of time and resources you’ve invested in each sale and the fact that your existing customers are far more likely to buy from you again than fresh leads. One-off customers are a good starting point but your goal should always be to turn them into repeat buyers. Otherwise, you’re never going to maximise the return on everything you invested to convert them in the first place. Not to mention the fact they’ll probably end up with one of your competitors if you’re not able to make them into regular customers. Again, reaching out to customers after the sale is a crucial part of this but you also need to make sure your services are up to scratch – and this included the tricky topic of customer service. We mentioned earlier that response times are important and this is even more true when people run into problems with your products or services. Giving customers incentive to buy from you again is important, too. It’s amazing what the occasional freebie or loyalty reward can do and the power of a discount for customers’ next purchase shouldn’t be overlooked. If you’re in the retail game, recommended products and notifications about seasonal promotions are important for teasing people into the next sale. Once again, all of this can be automated with tools like ActiveCampaign and be sure to reach out to your customers with non-promotional content as well, so you don’t come across as a brand that’s always pushing for the sale. Figure out what kind of content is going to be genuinely useful to your audiences and give them plenty of reason to open your emails each time around. As marketing funnels become longer and more complex, it takes more work to plug the gaps and stop those leads from slipping away. You’re going to need access to the right data to help you spot these problems and solid automation platforms so you can respond to issues at scale, instantly. This technology is now available for businesses of all sizes, at prices even the smallest enterprises can afford – besides the fact it all pays for itself once you turn automation into better performance and bigger profits. This is the entire point of everything we’ve covered in this article: making the most of the leads you’re already generating and maximising results.